Help find a lost guar. Short-Tail is distraught. Her adorable pet, Puddles, ran away, and she's afraid that the little creature is lost. Find a Day-Old Fish in Northsalt Village or persuade Grubdosh to give you one. Give the fish to Puddles and lead her back to Short-Tail. Short-Tail is located northeast of Northpoint's Marketplace in the corner formed by the city's wall and Urbyn House. She explains how her pet guar Puddles wandered off. Tell her you will try to find Puddles and she responds, "Really! That's so kind. Puddles loves day-old fish. You can probably get some at the docks. I hear Grubdosh catches more than he can sell. And he has a soft spot for adorable creatures." Grubdosh is nearby within the city walls, whereas the docks of Northsalt Village are outside about a minute's distance away. To complete the quest through Grubdosh, however, you need to be able to persuade him. To reach Northsalt Village, leave through the northwest gate. During this quest Annarique Dailland will be present on the western docks along with the Day-Old Fish. If you try to take the fish when she can see you, she'll kick you into the water and you'll "fail" the objective. You can actually continue trying as many times as needed. Wait for Annarique to walk away and grab it while she isn't looking. Grubdosh can be found across the road from The Sloshing Tankard. Speak with him and you'll have two opportunities to persuade him to give you a Day-Old Fish, which he affectionately calls Petunia. Whichever method you choose to obtain a fish, your quest marker will update and point you to Puddles' location, which is somewhere random in the city. 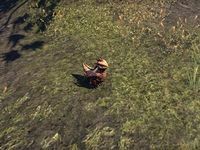 Walk up to the bantam guar and activate her to place the fish on the ground. She will now follow you around. Return to Short-Tail and she will thank you for your help. Unfortunately, Puddles will run away almost immediately after you reunite the two and Short-Tail will chase after her. Puddles will not follow you outside the city gates. This quest is falsely marked as repeatable. 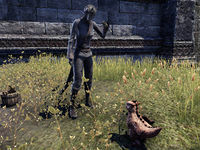 I agreed to help Short-Tail find her pet bantam guar, Puddles. But I need to find a day-old fish first. I should talk to Grubdosh or get an old fish from the docks. Now that I have a day-old fish, I should find Puddles for Short-Tail. Now that I have Puddles' attention, I should return her to Short-Tail. Finishes quest I brought Puddles back home. Now I should talk to Short-Tail and make sure everything is all right. This page was last modified on 25 August 2018, at 03:39.